Google has always been the leader of innovations. From search engine to Google chrome, all of its products are highly praised by the common man. The tech giant added a new product called Android in the year 2005 (actually Android was launched in 2003, but was acquired by the Google in 2005). Soon after Android based smartphones rolled out into the market, the era of Symbian, Java based smartphones were about to end. And as the company never halts at a particular stage, regular up-gradations were made in the functioning and designing of the Android OS. 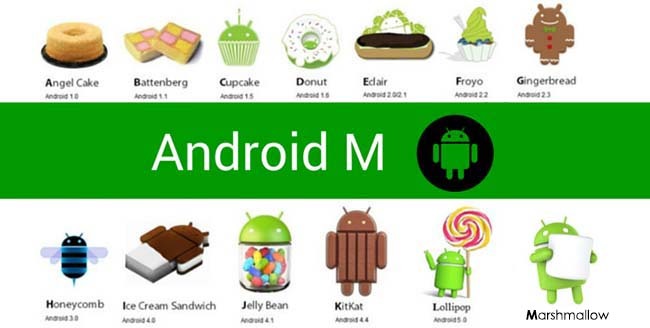 The timeline of Android from Cupcake(1.5) to Lollipop(5.0) has experienced a great success. And now in that row, the company has disclosed that the new Android version is going to launch soon as Android Marshmallow. Each and every new version of Android grabbed some tweaks in terms of designing, functioning and many more. The same is in case of this Android 6.0 too. But you might be confused for what new features this 6.0 is going to offer. So, lets checkout the top new features which you will gain with this upcoming Android version (6.0). It was a long time problem for Android used for, how to allow only limited permissions for any app. This time in 6.0, the problem has been overhauled by the company. Now, while installing or updating any app, no permissions for the app will be asked. They will only be asked at the time they are in use. Not only this, you will be given the option to select or reject individual permissions. Like for e.g. In case you are running a messaging application, you will be required to allot permit for the camera, gallery, music and many more; all in a single pop-up. But, Android 6.0 will offer you individual permission to be granted or rejected. Apple has already made Fingerprint option available in iPhones. Somewhat similar is going to happen to Android Marshmallow too. The OS is going to support the finger print feature which was a dream till Android Lollipop. The team of developers is working on different phones to make the fingerprint support work for them. This feature will be highly used to make App Store purchases, unlock the device and Android Pay transactions. Like Apple Pay, Samsung Pay, Android too going to avail Android Pay in the upcoming OS. In actuality, the company launched this service in 2010 with Android Gingerbread. The service was later made compatible with Android Kitkat and later versions. With this service, the user will be able to checkout for any purchases with the use of NFC technology. The point to heed in this service is that it provides a virtual account number, making it secure as your actual ID is not shared with the retailer. The developers are working to add this feature in every major application to make the purchase quick and convenient. When it comes to developing an advanced OS, the need of a hardware platform with good battery backup is needed. But what if the power management can be done with the help of an inbuilt app. Android 6.0 will be made available with an in-build an application which will handle the background processes and enhance the power performance. Google claimed that this feature has already enhanced the stand-by time of Nexus 9 to a higher extend. To simplify the sharing of data, Marshmallow has been given a floating toolbar which will make it easy to even copy and paste from the web pages. The reason behind offering a floating toolbar is that with this the process of copy paste will become quick and efficient. Apart from this, the OS has also been given more effective volume control. The reason behind this step was that the volume control in Lollipop was not loved by the users. So, Google implemented in that regard and resulted with individual volume controllers for every sound related app, either it may be music or alarm. As per the availability of Android 6.0 is concerned, it is being expected to be gifted to the smartphone users in this Autumn. There is not any doubt that this upcoming Android OS is going to offer much more than Android users were expecting till now. But till then, you need to wait for this Google product.